Are you ready for some serious football food? These Buffalo meatballs with homemade Blue Cheese Dip are a real crowd pleaser. But don’t tell, they are actually healthy! I’ve got serious snack fever these days! My husband and I love buffalo wings. Of course, boneless wings are even better! 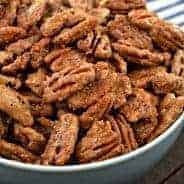 Today’s recipe is a healthier version of our favorite snack. But don’t tell anyone! Health food and football can be a scary combination in some households! The meatballs are made using low fat ground turkey. I love substituting ground turkey for beef in many recipes. Especially meatballs! There is so much flavor in the meatball and buffalo sauce, you won’t miss the heavy ground beef. And the dip? I substituted Greek Yogurt for the sour cream in this recipe. There is still some mayonnaise, but only because my brood of children like full fat blue cheese dressing, and they didn’t like the zing that greek yogurt without mayonnaise left in this dip. I liked it without the mayo, but you decide as you make this recipe which way you prefer your dip! A big plate of these buffalo meatballs paired with some Reese’s peanut butter dip, and I think you’ve got your Superbowl menu! 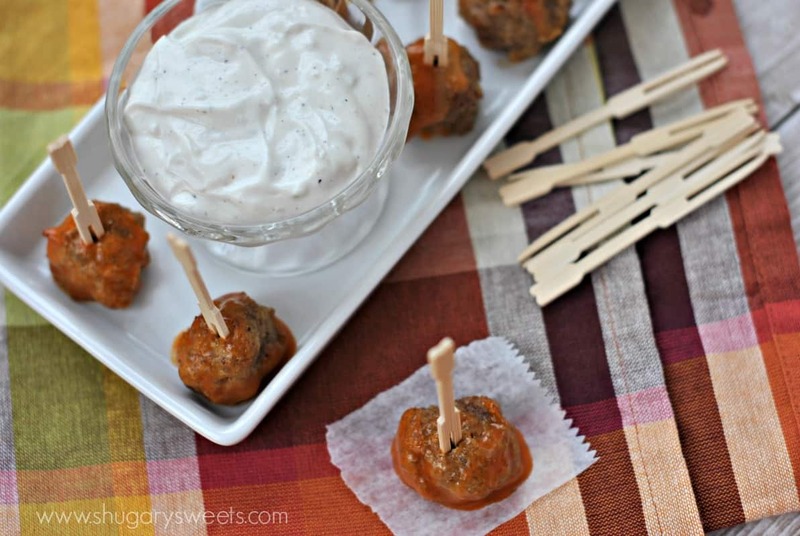 Easy, homemade turkey meatballs with a delicious buffalo wing flavor. Serve with homemade blue cheese dip! For the meatballs: Combine ground turkey with egg, breadcrumbs, salt and pepper in a large bowl. Mix with hands until fully blended. Scoop into desired size meatballs (I use a 1 Tbsp scoop) and place on a foil lined baking sheet. Bake in a 425 degree oven for 25 minutes. Allow to cool about 10 minutes on pan, then remove and place meatballs in a large bowl. 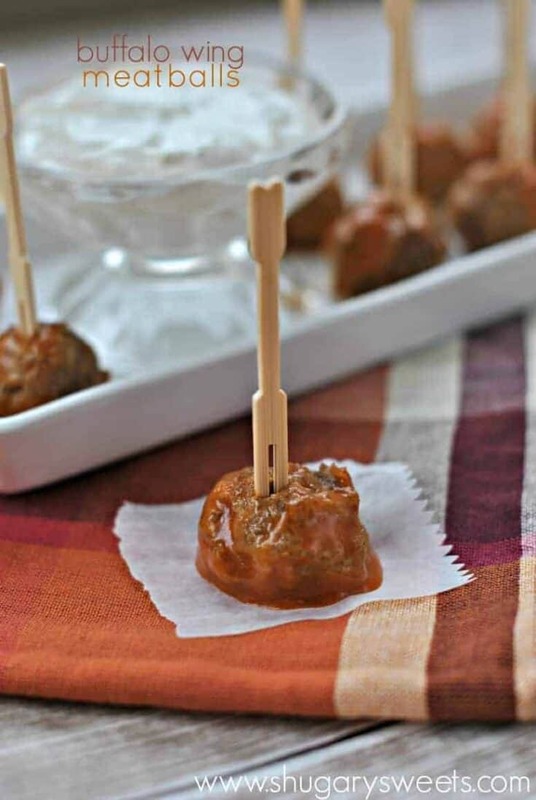 Pour buffalo sauce over meatballs and serve in a bowl or on a platter with toothpicks. For the Blue Cheese Dip: In a small bowl combine all the ingredients for the dip. Refrigerate until ready to serve. 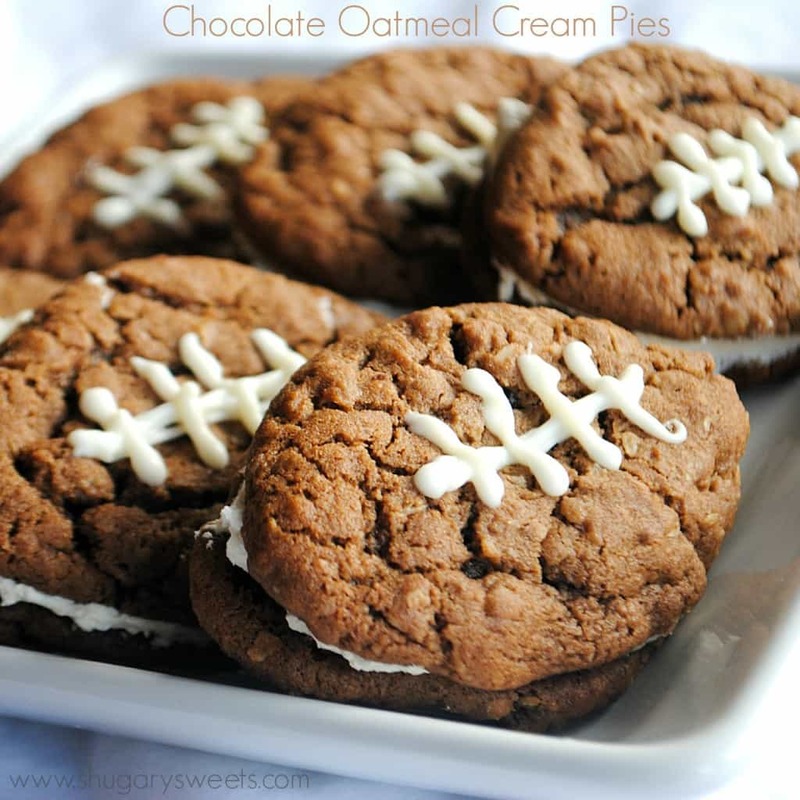 Chocolate Oatmeal Cream Pies: just like the classic Little Debbie treat, but with chocolate! 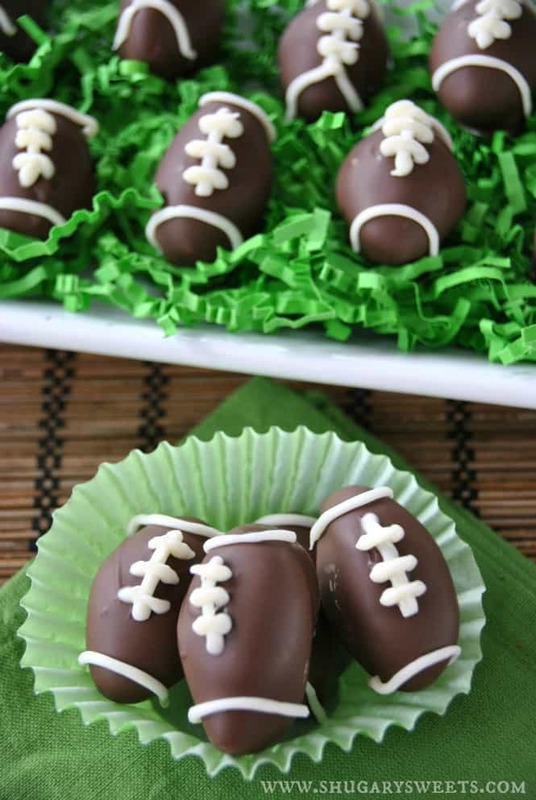 Homemade Peppermint Patties in the shape of footballs!! I can’t wait to make these! 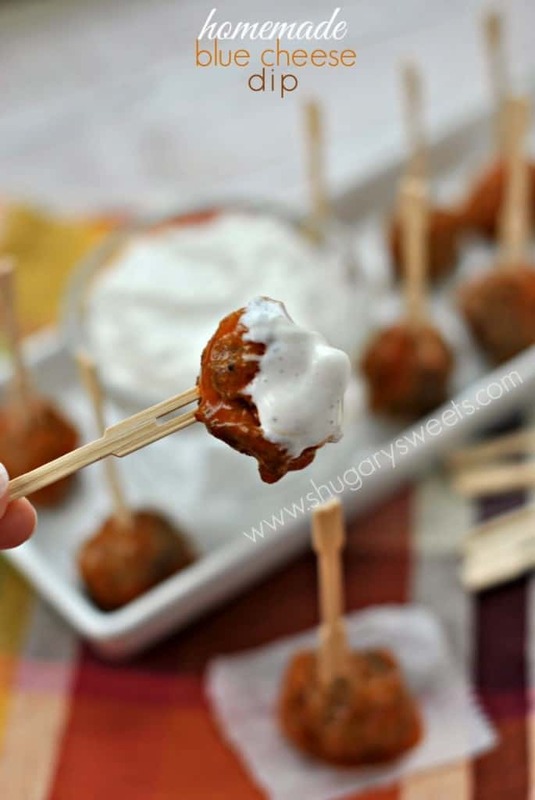 I love buffalo and blue cheese combination and they are so perfect for game day! um, ok. I love turkey meatballs. I love buffalo everything. 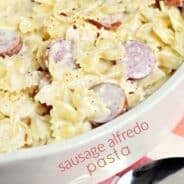 I love this recipe!!!!!!!!!!!!!!! Total winner. 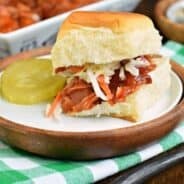 HEALTHY buffalo chicken? Sign me up, Aimee! These are the best combination of flavors! And I am on such a blue cheese kick lately! Perfect! 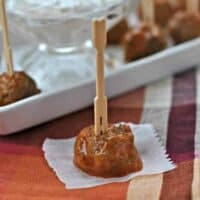 Buffalo meatballs that are healthy & delicious? Yes, please! These meatballs are incredible!!! I love the buffalo sauce idea! Yum! Never thought of that combination! These look amazing! So perfect for a party. We actually aren’t big Super bowl people in my house, but that doesn’t mean we don’t like all the little finger foods that go with it! I love that these are healthier, but still look totally delicious. And, I love your colored placemat..so fun! Meatballs are pretty much my favorite food and have been quite popular this week. I’m sharing one of my favorite meatball recipes on my blog and I’ve seen several others posted this week that I have to try – these included. I agree, no one should even miss the beef with these buffalo turkey balls. I’m on a spicy streak right now and I think I’m going to have to make these very soon. The turkeys were on such a great sale this past Thanksgiving that I bought 3. Two of them are still in the freezer and I just might thaw one out and try making my own ground turkey. Have you ever done that? Shhh, don’t tell my husband. He’s probably waiting for another stuffed turkey dinner. The only reason I like the Super Bowl is for the food…did I just say that out loud? 😉 Love all the flavor of this fun meatball! Although I would have to leave out the blue cheese on mine…just can’t do it. But my hubby would be all over it for sure!!! I love that we both did the buffalo thing this week 🙂 Such a great party food! Perfect party food! Love that you lightened it up with ground turkey and Greek yogurt! My husband will flip over these meatballs 🙂 they look perfect! You had me at blue cheese. And buffalo! Yum yum yum! I love the healthy twist on these – I’m sure you don’t even notice! Sign me up for anything buffalo! Especially when watching football – yumm! Pinned! I love buffalo wings. I love meatballs. I love bite-sized snacks. TRIPLE THREAT FTW. 😀 Bravo Aimee! What a fantastic idea! I love buffalo wings! These look great! By buffalo wing sauce do you mean straight up Red Hot or something specifically called buffalo wing sauce? I use actual buffalo wing sauce. Kroger has their own brand, but I’ve seen several in the stores! Not sure what Red Hot is?? Frank’s Red Hot is the hot sauce base for the original buffalo wings (I’m from Western NY where they originated). The original recipe for their wing sauce was 1/2 cup hot sauce plus 1/3 cup melted butter. I have never bought premade wing sauce, but may have to look at Kroger. Gotcha. You can use the Frank’s and make the wing sauce according to the bottle, then use that for the meatballs!! !